YourSmallBizCollege.com – The Super Saver For 2009 Businesses? Three years in development, over 10,000 hours spent turning over every rock online, and 2 partners…put all of that together and you’ve got a link www.YourSmallBizCollege.com. By clicking on that link, you will come across the most complete resource center for businesses that I have seen. Their subhead reads, “Over 35 Categories About To Bust Loose With Trusted Tips and Tools: Video Tutorials, Business Planning Forms and Templates, Software, eBooks, Internet Marketing Training Webinars, Social Networking Apps, Widgets, and More!” Let’s just say, I was intrigued. I now have access to the site, and thought I’d share my review of it with you. I’m sure you’ll come across a lot of promotion for this site. It is said that by the end of their first week, over 300,00o people will have received emails about this inexpensive membership site. So what’s in this A to Z business site? Over 35 categories to choose from including: Franchising, Business Coaching, Legal/Taxes, Affiliate Marketing, Real Estate, HR/Payroll, Import/Export, Non-Profit, and Private Label. Over 50 business coaching resources, tips, techniques, and secrets revealed. You will even find places to take business classes at Harvard and Yale online for Free. They’ve purchased resell/reprint rights to over 40,000 e-books and internet tools just so you could use them in your product or service promotional efforts. MySpace, Twitter, Facebook and YouTube all explained for beginners. Business plan outlines, forms, letter and email templates, and more! I’ve only just begun to crack open this site and see all there is to see. It will probably take me weeks to take advantage of all the information. I encourage you to go to www.YourSmallBizCollege.com and watch the video on the site set-up, read their sales letter on what is included, and see if it’s a good fit for your business in 2009. Last week I walked you through the ins and outs of the top Social Media site, Squidoo. Since it’s one of the top 500 most visited sites in the world, I thought you (and your company) would benefit from such a great marketing tool. We had a little contest on who could come up with the best Squdioo lens promoting their business, product or service. Sandy Dixon, owner of Interior Arrangements is our winner! Sandy’s company opened it’s doors in 2002 and is a nationally known success center for training people on the ABCs of starting and maintaining a professional real estate home staging career. Sandy is a former Realtor® and sales, marketing and training executive. Interior Arrangements also offers redesign/staging workshops for both existing business owners and those looking to start a new career. One of the challenges in writing copy is that it is very difficult to get inside of your customer’s head and view the problem or solution from THEIR side of the table. This is where market research comes in handy. How about a quick copywriting tip? One of the biggest obstacles to overcome is to stop looking at your product or service as a means to make you money (that will just naturally happen if you market it the right way). Instead, start looking at your product as a solution to a problem. What problem does your target customer face every day that would make them want to buy YOUR product versus any other product of its kind? Switching the way you approach writing will boost sales and give you repeat business. In Sandy’s Squidoo Lens, she continues her post by providing 3 great tips to selling your house quickly – something that a lot of people will be interested to read. “Lists” are such a great way to approach writing. You could do a lens on “The 7 Reasons Why x Is Better Than y”, or “3 Reasons You Have to Switch Mobile Providers Today” – etc. Lists make for an easy read, and with the world in such a “rush” people appreciate you catering to their busy schedules – WHILE giving them valuable information. And last, it’s always a good idea to add pictures or video into your posts – even for your blog. 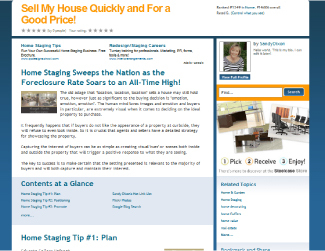 For example, if you visit Sandy’s blog at www.StagingTutor.com – you will see she usually tries to add examples of what she talks about, in picture form. I usually always have an image or video in each of my blog posts. Don’t you think it makes what you’re reading more interesting and helpful? Shoot me a comment and tell me about your blog (give me the URL too). I’d love to see how you guys are using information like this to build your business. Is the Traffic Manifesto by Ross Goldberg Here to Stay? Being in the Internet Marketing business for 13 years, I have come across quite a few clients who are weary of the Internet because of their “lack of technical skills” when it comes to computers. Well, I am here to tell you that you don’t have to be a know-it-all to make money online! And that is what Website Waves is all about. I want to hand you the tips and techniques I have learned in my career so you can make a splash in this giant pool of the World Wide Web. 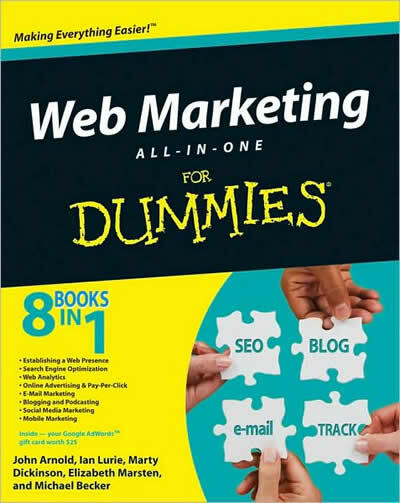 That said, I have a little secret weapon for all of you Internet Marketing newbies. 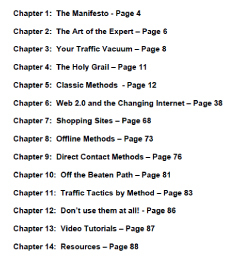 The Traffic Manifesto written by Ross Goldberg is a must read if you are just getting started online and don’t know how to juggle all of the different social networks, or which article submission sites are the best to be featured on, or if you don’t know what a Squidoo lens is. This eBook is also a must read if your business is on a slippery slope due to the economic downfall of 2008. Going back to the basics and learning the simple and FREE ways to get traffic to your site, could just be the answer to your income worries. So, what is in this Manifesto? How about URLs to hundreds of article syndication sites, and dozens of press release syndication sites, podcasting directories, top social networking sitesm blog and RSS feed sites, affiliate program directories sites, video sharing and social bookmarking sites – 131 pages of how tos and links. Ross outlines 79 different ways to drive traffic to your blog or website – and most of them are free methods. You might have seen the Manifesto selling for $97 which offers a range of bonuses, but I tracked down the same Manifesto selling for only $37 to save you a few bucks if you decide to get yourself a copy. 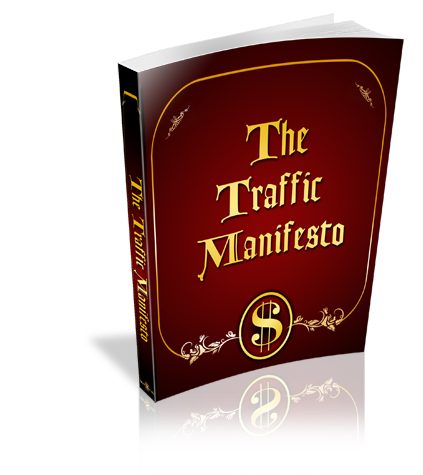 If you consider yourself technically challenged, or need to boost sales for 2009, check out the Traffic Manifesto here. If you already own a copy, or have seen other Ross Goldberg products and have an opinion, leave me a comment and tell me what you think. I’m thinking it’s here to stay!